I wrote the haiku this morning. 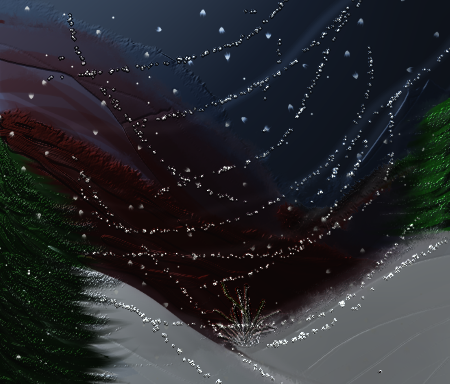 However, I began this digital painting in early November 2012. My original doodle was simple. I had a vision of innocence for the winter season. I even tried to capture a memory from childhood, one of freshly falling snow. I envisioned a day trip in the Sierra Nevada mountains. It was a time of joy and serenity. My painting started out much bigger, with bright colors, and lots of light. For whatever reason, I felt compelled to stop and reconsider the landscape. Was life so simple, clean, and picturesque? Was my vision simply to recreate a lost reality? I started to lose my focus. When I returned to painting over a month later, my vision was not so clear. My memory seemed fuzzier. I felt compelled to deepen the mood. My lovely landscape became transformed. Why did my vision change? Perhaps I was distraught after recent acts of violence and loss of life in Sandy Hook? Perhaps I was distressed from the reactions from both sides of the political aisle? How did so many people become so sanctimonious and self-righteous? My soul tells me the reactions are simply manifestations of the human condition. From here, I can only hope our society takes a step towards enlightenment. Can we learn how to cope with our differences without the use of violence? Or is that too simple a vision? Sunday, December 23, 2012. I doodled this image using ArtRage Pro. Each of us can make a difference at some individual level, So, no vision is ever too simple. That is truly a wonderful parable, Ramana!